NOTE: The following post may contain spoilers for the first chapter of my campaign, The Coming Dark. As I've mentioned to a few people recently, I've been somewhat disillusioned with the fist full length campaign I'd created, The Coming Dark. For a while, I wasn't sure why... I thought it was simply "DM burnout", or spending too much time in its design, general writer's block, aversion to interacting with the WotC forums, or something else I haven't quite laid my finger on yet. But since that first module I've published two others (The Endless Winter and The Dragon's Master) and am about to publish a third (The Heart of Fire), and during that process I have learned quite a lot about campaign design. And interacting with the Twitter and blogging community has helped me immensely to see the type of game people want or don't want. Part 1: The Village of Solis. Playes arrive in the village of Solis. Extended rest and plot exposition. Boss fight. Not the best of bosses, in my opinion. Three to four optional encounter areas that are along the way to the destination. The path to the destination is a road, a predetermined path through which there is no other way to get around. Boss fight. Probably my favorite, even though it's gone through at least four different iterations. There is a direct path to the final encounter, which consists of 5 different areas (not counting the final room with the boss). Three of those areas are full on encounters. A lot of secondary rooms that are either completely optional or contain something that the party needs to advance. There is no obvious indication that that is the case. Several of the rooms expand on plot elements integral to the story, and if the players don't go through the effort to inspect these rooms now, they'll never get the chance again and they won't have any idea what's going on in the future. Final boss fight. Once the fight is over you are effectively ejected from the tower and do not have the option to revisit areas you didn't get the chance to. In looking at all the above, it almost sounds like a season of D&D Encounters... The encounters are not avoidable, come sequentially and there's no way around it all. 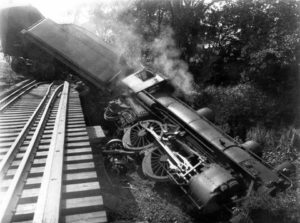 Just plow through as if you were "on rails". With The Heart of Fire, I decided to attempt doing something different. I created multiple paths to reach the final destination, some of which are either full on roleplaying or "kill anything that moves" if you are so inclined. There are over thirty distinct encounters and situations, yet you only need to experience a fourth of those to reach the boss. The rest is just filler that the party can explore at their discretion; there is no pressing need for the party to rush to meet the boss (in TCD, there is most definitely a need to reach the boss quickly before he does something "really bad", so much so that one of the groups I'm DM-ing the campaign for is at the end of Part 3 and hasn't taken an extended rest since Part 1), so the players can explore at their discretion. Also, the main setting of HoF is an island and you know where you have to go on it but you're welcome to work your way there any way you want. There isn't a long, clearly defined road that you must travel and not deviate from. Heck, I even included a random encounter list for the wilderness if the DM and party are so inclined. The party could wander the island, exploring every nook and cranny of it, for *days* if they want to. In retrospect, I somehow like this system more. It gives the players freedom, and makes them feel like they're not being dragged around by a DM that positively, absolutely, has to get them to the next encounter or else he simply doesn't know what to do. And even though TCD has less encounters and smaller maps than HoF, it's a good 30 pages longer. I think I wrote too damn much. So, once I'm done with The Heart of Fire (for which I'm actively creating both D&D 4e and Pathfinder versions! ), I'm going to revisit TCD and rework a great deal of it. This includes probably throwing out most of the Tower of Light, and maybe even reworking the continent and the storyline to allow for more diversity and to remove that sense that the campaign is on rails. I don't know how I'm going to do that yet, but I think it's necessary. Now some of you reading this are part of my current campaigns, and maybe the above will provide a little explanation as to why I haven't been pushing those campaigns along for several months now. It's that simple: in light of what I've learned I've grown to not like my initial design, so soon I intend to rework the whole thing and make it a better experience for everyone, something I can be happy about and something I trust you will enjoy. If anything, you as players have helped me see that, so I ask that you be patient... It'll be for the best in the end, and the game will go on as soon as I feel it is ready. Until that time, development on The Heart of Fire continues. The 4e version is complete save for two sections (one of which is waiting on me being able to commission a map of the volcano island of Pyrias, which I cannot get until my financial situation improves... Thank the holidays for that), and I've started to create the monsters for the Pathfinder version (which is a heckuva lot of work!). If all goes well, the module should be completed and published by the end of the year. Be patient and stay tuned. So I have completed and released The Endless Winter through T. W. Wombat's Winter is Coming Blog Festival, apparently to some rave reviews. Many have commented on the professional look of what I put together... I joked about "overdoing" my submission, but quite frankly I wouldn't have it any other way. One the one hand, yes, I'm a game designer who likes the process of creating stuff others can use. But I'm also a publisher who tries to reflect his interest in making quality merchandise in everything he does, so I'm not one to just slap content together just to get it published. So it might have taken me ten times longer to format and layout the adventure than it took me to actually design the mechanics of it, but I'm OK with that. If I manage to create a product that people like and can say "wow!" when they look at it, mission accomplished! Besides, it looks good on my résumé... Don't ya think? I am giving it away for free for now, and it's currently also available for free on Drive Thru RPG (where it includes the tactical maps and 50 DPI images for use in third party applications!). If you downloaded it before the tactical maps became available, email me at dflor@brainclouds.net and I'll send you direct links so you can get them; I tried emailing everyone who had already downloaded it, but Drive Thru RPG has some... "issues"... with its email system. I have yet to send an email through their site out correctly, so my blast got sent without the link in it. The Coming Dark is still sitting there as an enormous, virtually complete PDF. There's a long story behind this, but that's for another day. I've been kicking around a concept that will either be a Fourthcore adventure or a Lair Assault encounter. Or both. I haven't decided yet... But it's a concept I just can't get out of my head, and it involves some elements I had planned to use in my canceled Gammacore adventure Where Worlds Collide. I have several more map packs planned - a dragon's lair, a goblin's lair, a roadside keep, a ziggurat in an evil place, etc... - but that's just a matter of getting around to doing them. Those are actually a considerable amount of work because of how badly Adobe Fireworks CS5 screams in agony every time I throw a big file at it. In the very near future I'm going to write a short series of posts called "Mapmaking for the Non-Artist" which describes how I - a person with almost zero artistic skill that can't draw a decent looking square at gunpoint - manage to create the maps that I do. This will everything from what tools I use to how to add certain special effects to the maps. I will not assume extensive experience in Photoshop (primarily because I don't have that experience myself), so it will center around Fireworks and other low end drawing tools. Stay tuned for that! Because The Endless Winter got such a good response (150+ downloads through Drive Thru RPG alone, and I have no idea how many downloads through Wombat's blog), I'll probably make some more of those, either by making separate adventures or an actual series. Making The Endless Winter was actually really fun to do to be honest, and I enjoyed the experience so much I can't wait to do it again. 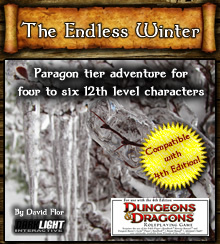 I am currently experimenting with converting The Endless Winter to Pathfinder. I've never actually played Pathfinder itself, but have played D&D 3.5e so I'm familiar with the mechanic as a player. But it's an interesting challenge to convert an existing 4e product to Pathfinder, and its an exercise I am also considering documenting for the sake of this blog. Tomorrow starts the window for submitting things to Wizards of the Coast for Dragon and Dungeon magazine, and I'm considering submitting a few things. Among all of my ideas, I'm probably going to get myself in trouble again for suggesting they let me make Gamma World (*writes check! *) content (including the concept of a certain doctor and his fortress of evil), but you can't blame me for trying. Anyway, more to come in the near future! I have been working on getting my Wayside Inn map ready for publication as a map pack. For most people, this is kind of an easy thing, but I'm a bloody perfectionist sometimes... So I completely re-did the map for the third time, this time in 200 DPI so it doesn't look bad in full scale. The first floor of the Wayside Inn clocks in at 26" x 28", which makes for a huge map (5200 x 5600, 197Mb) that Fireworks has a really hard time handling. On more than one occasion I've had Fireworks balk and say "screw you, I can't do this." I've asked around what it would cost to put this on a glossy poster that allows for dry erase and I've gotten prices between $10 and $100 a copy, so I'm not sure about the possibility of printing this full scale on a single sheet. So for now, thanks to Newbie DM's suggestion, I'm using PosteRazor, which is a wonderful little tool that takes any image and cuts it up so you can print it and composite it yourself. That was something I was doing before, but this little app makes it so much easier! The lobby, a massive room complete with nine tables, a fireplace, a 50' long bar and even a place for the Ethereal Bard! Full kitchen with storage room. Numerous windows through which you can make a dramatic entrance or a quick exit. One "deluxe" room with three beds. A few windows through which you can jump out and fall to your death. It's my favorite map from The Coming Dark, Chapter One: Into the Light, and also contains one of my favorite scenes. But I do not want to publish just the map... I want to publish something that can be useful above and beyond that, something that DMs could drop in to a campaign with nominal effort. So I want to include detailed descriptions of everything, and possibly include several encounters, skill challenges, etc... that are not linked to a specific campaign and can be used by anyone. Although my intention is to create a lot of generic descriptions, the content that is edition specific will not be limited to D&D 4e. I want Pathfinder, D&D 3.5e... even some older or alternate systems that I haven't thought of. I want it to be useful to anyone that needs an inn. And let's face it... everyone needs an inn in their campaign at some point! I'm curious to hear what some of you would make of such a place. I was tempted to ask for submissions or create a contest, but since this is going to be a retail product the financials of that could get somewhat complicated. But I'll tell you what... If you are eager enough to create a scene - be it an encounter, skill challenge, roleplaying situation, etc... - I would be more than happy to see it, and if it's cool enough I might ask you to include it in the final product. Until I can work more on the internal content, I'll spend my time trying to come up with a cover page that doesn't look like crap. I'm in somewhat of an awkward situation. Last week, while I was out of town on vacation, I was hit with a "cease and desist" order preventing me from distributing the Fire From the Sky Gamma World module to anyone. Note that I say "distributing" and not "selling"... As per the C&D, I'm restricted from giving the module to anyone, even for free. FFTS is now a controlled substance. NOTE: I have asked for authorization to publish the C&D letter verbatim as I received it, but have not gotten approval to do so. Just to be safe, I will not publish its contents until cleared to do so. Since then I have attempted to contact the legal entity that sent the C&D for clarification on what the issue is, but there's a problem: the legal firm that sent the C&D is a law firm in New York City - Patterson Belknap Webb & Tyler LLP (hereinafter refered to as "PBWT") - and not Wizards of the Coast's legal team in Renton, Washington (who are the people I originally contacted). PBWT apparently cannot speak on behalf of Wizards of the Coast without contacting WotC first (they make no decisions on their own), so if I ask PBWT any question they must send it to WotC Legal in Renton, wait for a response, then respond to me. I'm dealing with a third party, not WotC directly. I'm at one end of a legal grapevine, having to wait for my message to bounce all the way to Washington and back. Seriously?!? What century are we in again? It's been about three days since I sent my first volley of questions, and I have yet to hear anything. At this rate, it may be months before I have any idea what the issue is or what I am allowed to do in future products. The Fortress of Dr. Neb, Gamma World module. This campaign may be pretty much dead at this point. My big campaign, The Coming Dark, which is normal D&D 4e and not Gamma World. ...are on hold. I don't know what to do with them at this point. I'm afraid to work on anything, unsure whether I'll be wasting my time on a project that may never see the light of day. I'm kind of hoping that there will be some sort of WotC legal representation at GenCon, so maybe I can sort out these issues in person. In the meantime, I do have some news: a third party has contacted me and expressed interest in converting both Fire From the Sky and The Fortress of Dr. Neb for use in Pathfinder and the upcoming Warlords of the Apocalypse supplement, even though nobody seems to be sure when that supplement will actually be released (it's seem to have had quite a turbulent development history). So stay tuned for that! On another note, I am seriously considering running Fire From the Sky at GenCon; although I'm restricted from distributing it, I'm not restricted from using it myself. The only problem: I haven't DM-ed an in person game in well over a decade, so I'm not sure if I can handle it. So I'll hang out and watch others DM for the first few days just to make sure I can be on par with everyone else, and if it does happen might be Saturday. Don't bank on it, but we'll see if I can muster the courage before I'm on the flight back. I might even make a special "THE MODULE THEY DO NOT WANT YOU TO SEE!!!" cover for it. In the meantime, if you have an "in" with someone at Wizards of the Coast I would appreciate some insight as to the issue with Fire From the Sky. I would be willing to provide you a copy of the module if you work for Wizards of the Coast; I don't think I can legally give you one if you're not.